This beet is made for slicing! 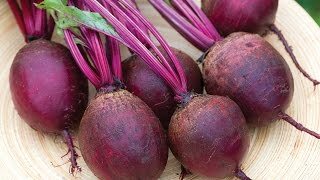 A unique long and cylindrical beet gives 3 to 4 times more uniform slices than round beets. Sweet, dark red roots are 8" long, 1 3/4" across. 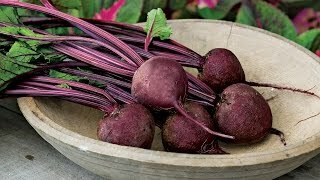 GROWING HINTS: Baby beets make excellent eating, and harvesting them helps the remaining beets grow better. When planting, mix beet seeds with fast-sprouting radish seeds to mark the rows. Grows best in full sun. Beet, Cylindra is rated 4.8 out of 5 by 4. Rated 5 out of 5 by Leslee from Excellent beet Last year was my first time growing these. They produced heavily compared to the golden beets and bulls blood beets, and the flavor of the cylindra was our favorite. Rated 4 out of 5 by Wryter from Terrific beet but I grew Cylindra for the first time this year so my results may have been my own fault. First of all they had very good flavor. My wife complained that they were a bit on the tough side (after 50 minutes on a full boil) but I think that was because I left them in the ground too long, I planted them in a 5 gallon container on March 1 and didn't harvest them until June 6 (a full 30 days longer than the package says it takes) so maybe they got a tiny bit woody. I still liked the flavor very much and the shape made slicing them much easier than other kinds. I'll grow them again next year and let one or two plants bolt so as to save the seeds. Kingman, AZ gets less than 8" rainfall per year, sits at 3500' and summertime highs are mostly above 100 with 109 or higher not uncommon. Winter lows rarely get below freezing but can drop into the high teens briefly. Rated 5 out of 5 by Victoria from Great canned beets I canned and gave my beets to individuals to taste test. Everyone raved at how great these beets were. Tender, juicy, and just the right size for canning. Rated 5 out of 5 by Songwood from Fantastic Slicers I grew these last year for the first time, and I couldn't be more impressed. Their size and shape makes them great for slicing--either for cooking or pickling--very little waste. The flavor was a bonus too--quite sweet. Definitely want to grow these again!